Watercolor and pencil, Strathmore Gemini 140-lb CP paper, in handbound sketchbook. Sketch approx. 6.5" x 8.25" (16 x 21 cm). 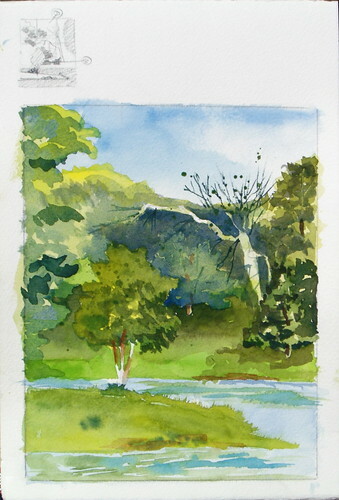 It was a gorgeous sunny morning, sketching plein air at Wild Acres Park. Several people were fishing from the banks of this little lake, including a family near my painting location. I was expecting a curious onlooker to stop by, but no one bothered me.